Idaho Chicken Ranch: Happy Valentine's Day! My sweet sweet husband began plying me with goodies on Wednesday, in the dire hope that I will agree to be his Valentine! 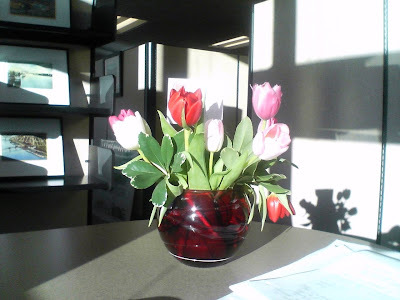 This lovely bouquet of tulips brought me the admiration and envy of all my peers. I'm definitely taking his request under consideration. He seems like a really excellent candidate.